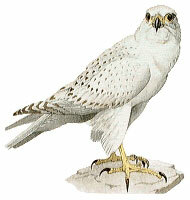 An impressive bird and the largest of the falcons, the gyrfalcon has a stockier build than the peregrine. Plumage can be dark, white or gray. Most breed north of the timberline and remain in the Arctic all year, but some populations migrate south for the winter. When hunting, the gyrfalcon flies swiftly near the ground. It can make rapid dives on prey, like the peregrine, but this is less characteristic. Birds are its main prey, although it feeds on some mammals, particularly in winter. Rock ptarmigan and willow grouse make up the bulk of the gyrfalcon's diet, and their numbers can affect its breeding rate. In years when these birds are abundant, gyrfalcons produce large clutches, but in years of scarcity they lay only a couple of eggs or do not breed at all. Gyrfalcons perform display flights when courting. When the young hatch, both parents bring food to them.